After a couple quick features from "The Today Show" gave us a look behind the scenes of Jurassic World, showing off some of the full operational theme park that people have been attending for years, now we get a different look at the kind of attractions that have been available at the park. 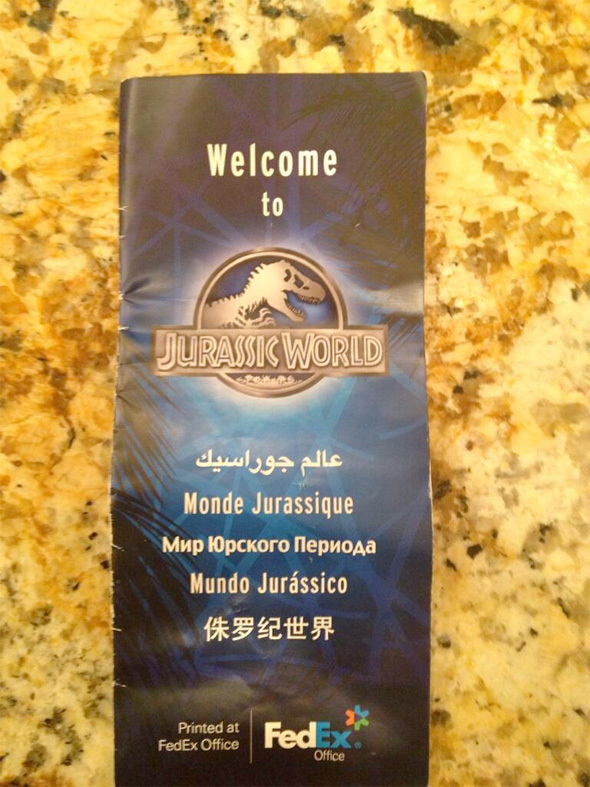 The Jurassic Park fan Twitter account JurassicP2K15 (via ComingSoon) got ahold of an official brochure of the park from the set of the film currently in production down in New Orleans, and while it doesn't show off any of the dinosaurs, there's a map of the park, a list of the dinosaurs they've bred, and of course some product placement. Look! the lack of Velociraptors is disturbing! 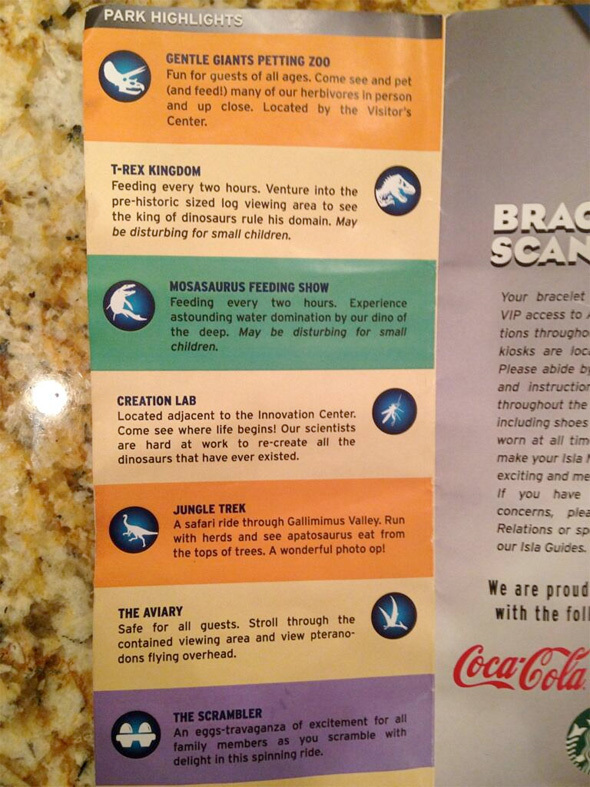 I remember reading that part of the plot involves Chris Pratt studying the behavior of Velociraptors. 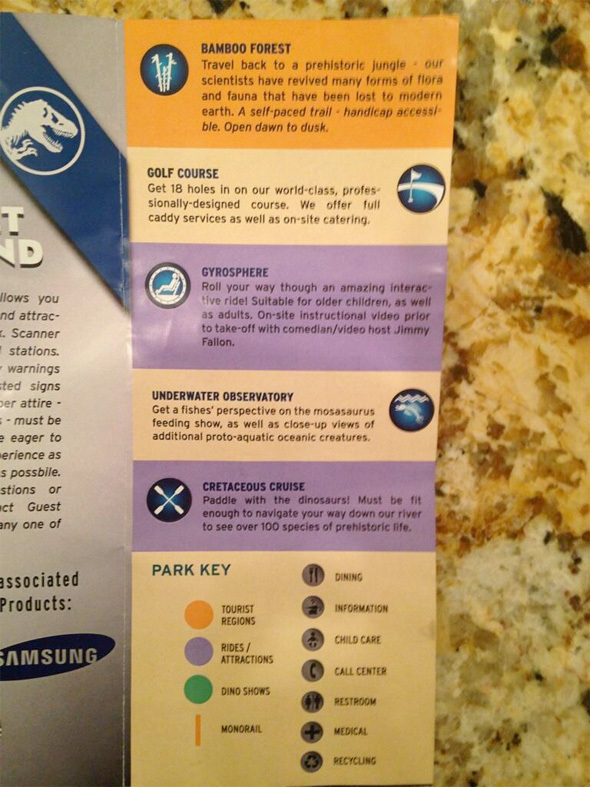 So maybe they're in the park, but not an attraction yet because of the potential danger they cause? Actually you've reminded me of that info i've read somewhere! If it's so...it's actually pretty clever! The raptors always add somekind of a visceral cunning to the movies, and were my favorite parts from teh previous films! Hope they're in this too! I think it would be a smart move to remove them. Get some other dinosaur. While we're at it lets make a sequel to Jaws but leave out the sharks this time. Didnt realize the movie was called Raptor Park, there are lots of midsized predatory dinos you could use to replace raptors. 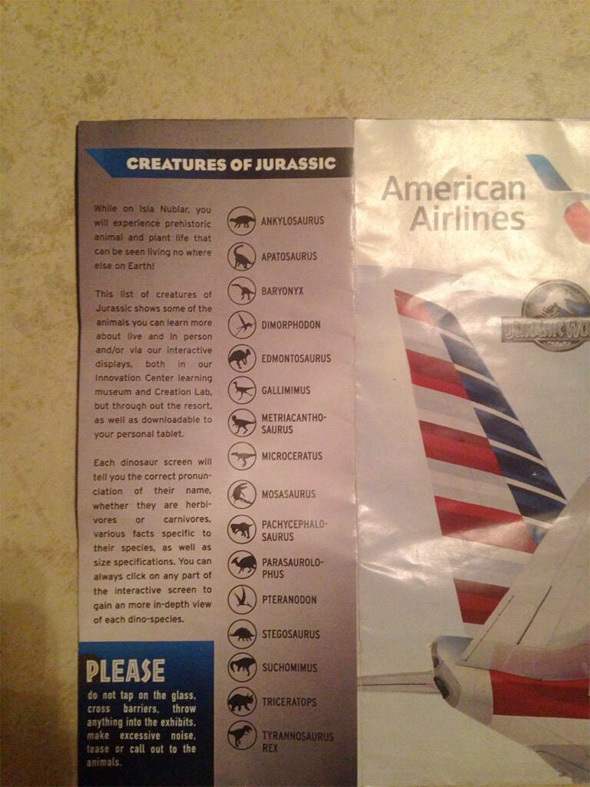 As people have stated, there are no references to velociraptors. However, yes it has been said Chris Pratt's character studies them. 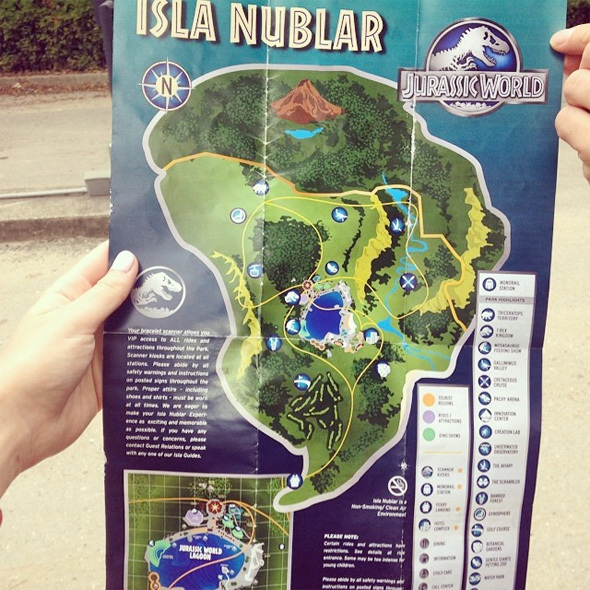 I'm thinking, as like the purpose of Isla Sorna (Site B) in Lost World, there may be a section of the park cut off from the guests where they grow and nuture the hatchlings before introducing them to the park. Basically a quarantine area, like most zoos today have. Which would be why they're not on the map. 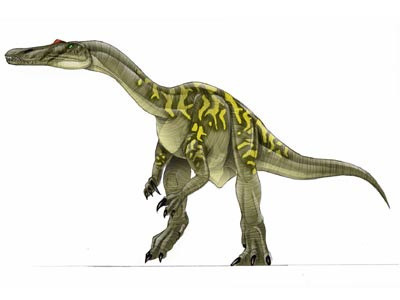 What's also interesting, is there's no sign of Spinosaurus, however, the park does have the two most closely related and very similar species Suchomimus and Baryonyx. There are a lot of fan favorite dinosaurs missing on the map from the previous three installments (velociraptors, copies, dilophosaurus, brachiosaurus, spino, ceratosaurus, and corythosaurus) but it's great they're adding a bunch more new dinos. I just wish they had had deinosuchus as well. I want to go to the petting zoo!! !